These are the first two parts of the mystery SAL, I'm halfway now. Tomorrow I will start the Spring SAL, just have to dive into my bobbin boxes to search for the threads. I've got all numbers of DMC and a lot of spare ones, so I never have to run for a missing number. Once in a while I check if the bobbins are full enough and while ordering with Sewandso, I fill if needed. I hope to have finished the SAL by the end of this week, then tackle the BD cards for February. 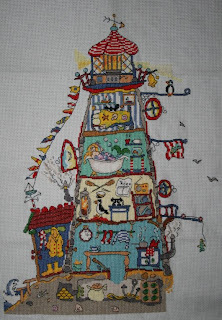 And finally go back to stitching the Cut Thru Lighthouse. 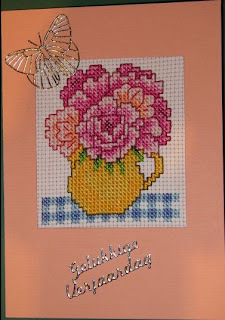 This is the card I stitched for Heidi who is on the birthdaylist of one of the Yahoo groups I belong. I know she loves America and this year she chose this country as a theme. She is without PC at the moment, I read on the group, but the card is definitely on its place, so I can show it. I didn't stitch this week, times were to hectic with hubby in hospital. The doctors had a nice surprise for us: he can come home tomorrow, the wounds are healing well and he is free of pain most of the time. I'm so happy for him, the poor darling has suffered so much the past half year. 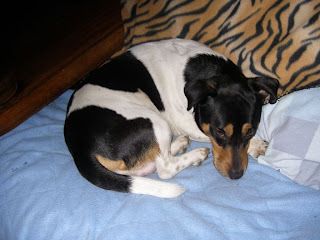 And on Monday Kwispel (Flemish for tailwagger), a Jack Russell, is coming to live with us. It's DD's dog. They recentely got a second dog and they are quarreling too much. The other dog is too big to handle for my hubby (it's a Danish Dog), so the small one is coming to us. DD is very sad about it, but if she goes with the big one to an animal asylum, he will get a shot in the end. This is too sad as he only is 9 months old and very sweet. Kwispel is jalous and is making life bad for him, so the only option is to separate them. Our cats know him from his visits, so they will get used to him being with us all the time very soon. And he will be good company for hubby when I go to work. Kwispel is rather quiet for his race, DD took care that he wasn't too much agitated when he was a pup. For those who are not used to kilos: I lost 11,44 pounds already. I'm thrilled! This is a non stitching message. Hubby is in hospital for his surgery (spreading of his cancer). It happened on Tuesday. It was a long surgery, it lasted 6 hours. But it went well. 3 surgeons did it and they could remove 95% of the tumor. It is now in the lab to determine what type it is and if something can be done about the last 5%. Surgery is impossible and radiotherapy doesn't work. And as for now, the doctor thinks that chemotherapy isn't an option either. The tumor was around a nerve bundle. It caused the pain and the immobility. The nerves could be 'cleaned' from the tumor, but there is no way to say if they will recover. The damage could be permanent. But hubby thinks the pain is already less, so high hopes on that. Of course his wound still is swollen and healing will take its time. Finally, after almost 2 years (when the cancer was discovered), I saw a glimpse of my old buddy again. It was if I lived next to a stranger all this time. I'm sooooo happy to have him back and the immediate danger is gone. He will be in hospital probably until next week Friday (although I hope he can come home earlier). On the diet front, I'm booking very good progress. I lost 5 kilos now. And it didn't cost too much trouble until now. Yippee!!! This is the first BD card for a member of one of my Yahoogroups. The receiver got it now and I can show it. Natascha chose as a theme teapots. One of the last British magz had a teapot alphabet and I chose three of them (without the letter). I think it looks nice. 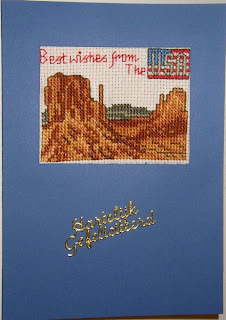 I'm stitching the second one now with America as a theme. I started the Michael Powell kit. I am taking the Lighthouse kit to the hospital to finish. DH will go into hospital on Monday, will have his surgery on Tuesday. It's becoming really scary now. My diet is going well, I lost about a kilo now which is very good and stimulating to go ahead with it. This is my almost finished WIP of Cut Thru' Lighthouse. I love the cut thru series so much, I have some of the kits in stash. 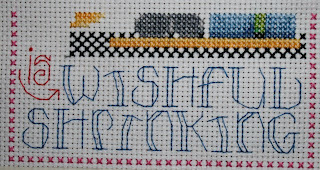 The next one I want to stitch is Cut Thru' Haberdashery, but first finish this one. I only have to do the right bottom and the lightbeams, they are in half cross stitch, so it should go rather fast. It was in my UFO stash, but I'm glad I took it up again. I want to pick up another UFO this year and finish it, don't know yet which one, probably one for DH. 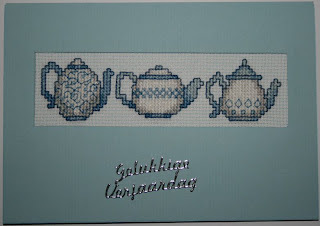 My fist project is finished, a birthdaycard for my CrossStitchLovers Yahoo group, we have a birthdaylist once again, this month I need to finish 3 cards,one is already on its way, the second I found a suiting design and the thirtd I will have to go through my charts. I will post them once they are received. 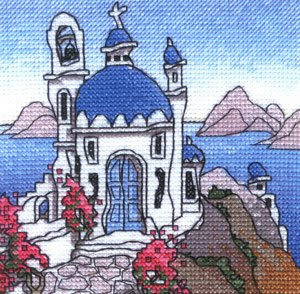 I chose my first small project for this year, it will be a Michael Powell one, the first Mini Greek Island. I love the designs very much, have bigger and small kits, the small ones will be tackled one by one. 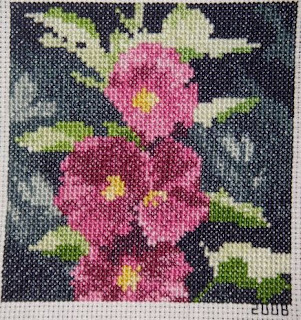 The mini Hollyhocks are from Heritage Stitchcraft. I try to finish one small design of the a year. I will choose another mini flower again this year. I did all the small kits with the animals already and some of the flowers. If I could only buy time and stitch a lot more. I didn't stitch much already this year, my middle finger is very badly infammated. Its to is almost double its size and gone to purplish. I have got antibiotics cream from the doctor and hope it will cure very soon, my fingers are aching for stitching! Today we went to hospital for the pre-surgery examinations. It's coming near now, next monday DH will be entering the hospital, the surgery will be the next day. 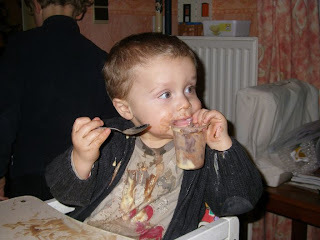 I wish you all a good and healthy 2009, with much love and laughter. I spent the last day of 2008 in bed with flu-type symptons. Took some pailkillers and could see the thirt part of Lord of the Rings on televison, which just ended before midnight. So could give hubby a big hug, wish him a year of full recovery and head back to bed again. Today is better already, I only can hope that the rest of the year will be better! This evening the boys will come with theirNew Year's Letter to read and we will order take away, no fuss about food today!